Busia — Security on the Uganda-Kenya border has been tightened following the Tuesday terror attack on a hotel and office complex in Nairobi's leafy Westlands in Kenya. The Anti-terrorism squad has been deployed at the common border. 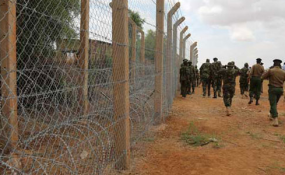 According to security agencies, the deployment has been tightened in Busia, Malaba, Lwakwakha and Suam border points. The Bukedi Regional Police Commander, Mr Ceasar Tusingwire, confirmed the joint police and military anti-terrorism operatives at Busia- Malaba border. "We cannot take what happened in Kenya [lightly]. We deployed on our borders and we are checking who is entering or leaving the country," Mr Tusingwire said. He said police are working with other security agencies to ensure the country is safe from terror threats. Daily Monitor has learnt that security has deployed intelligence operatives on the border. He advised people to be keen on their security and inform police in case of any suspicious people in the area. Mr Tusingwire also said several security check points have been erected at various entry points on the border. The 3rd Division UPDF Commander, Brig Richard Otti, said: "We are coordinating and for now our borders are safe. A lot has been put in place to make sure our people are safe," Brig Otti said. The Elgon Region police spokesperson, Mr Robert Tukei, said: "We have intensified on deployment and patrol on our borders. We request the community to report any new person in their areas," Mr Tukei said. Namisindwa Resident District Commissioner Mr Moses Wamoto Kigai said: "We condemn what has happened in Kenya. This are enemies to East African countries and the world."